The iPad has its share of feature-rich word processors like Pages and Documents to Go. But sometimes you just need a text editor, and you need to get your texts onto your Mac with the least amount of friction. Second Gear hears your call, which is why it released Elements, a Dropbox-powered text editor, for iPhone, iPad, and iPod touch. Elements is quite simple, really. It lets you create and edit text files that are automatically saved to your Dropbox account. While working on a file, Elements automatically saves your work every 60 seconds. If you don’t have a Wi-Fi or 3G connection, Elements lets you work offline and will upload all your changes once you get connected. Dropbox, if you aren’t familiar, is a Web-based file storage and sync service for Mac, PC, and mobile devices (much like MobileMe’s iDisk, though Dropbox syncing is significantly faster). It uses a freemium model that starts with 2GB of space for free, and larger amounts of space can be had for yearly subscription fees. You can customize some display features like the font, size, and color of your text, as well as the background color of the page you work on (though remember that the actual file is still plain text). Elements also supports TextExpander, and you can even shut off spell checking if you’re feeling adventurous or constricted by iOS’s occasionally stubborn dictionary quirks. Elements offers some clever features and style in comparison to competitors like Nebulous Notes and Droptext. 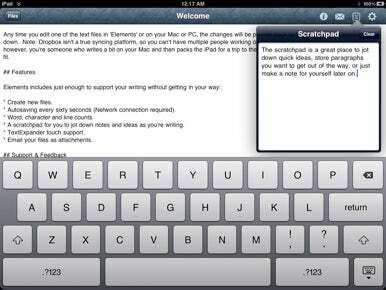 A scratchpad allows you to store ideas without having to create new files for each one. You can view a running tally of word, line, and character counts, and if you e-mail a file you’re working on, it is sent as an attachment—not simply pasted in-line in the message. If Second Gear’s name is ringing a bell, it’s probably because it’s the same shop that sold its iPhone apps in October 2009 after reaching its wit’s end over Apple’s sometimes schizophrenic treatment of developers in the App Store. Seeing a significant enough change in Apple’s practices and impressive new developer tools in iOS 4, though, Second Gear has returned, so Elements is a sort of grand re-opening for the company on the App Store. I was able to help beta test Elements, and it’s a nice, focused app. I’ve written a dozen Macworld posts with it, often on the train, and found that it fulfills its purpose really well. The blue marble toolbar texture and other bits of polish make this one of the more memorable 1.0 releases I’ve seen lately too. Elements is available as a universal app now in the App Store at an introductory price of $5. It requires iOS 3.2 or later.